You've already seen my 'no-makeup' makeup look here which was mostly done with Lakme. Here is one more look mostly done with Mineral Hygenics!!! I recently came to know of this brand. Its a USA based brand and as the name suggests its a mineral makeup brand. The foundations were the best part. There are 14 shades to choose from. I fell somewhere between Medium and Tan. Each skin tone has 2 foundation colors. I received 3 shades - Fairly Tan, Medium Golden and Medium Tan. They came in cute little plastic jars with sifter cap and black lids. They do claim sun protection but there's no mention of SPF. Here are the bronzer and finishing powder. I've never used a bronzer before this. The point is, here the sun shines so hard almost throughout the year and I actually have tan and I never felt the use of bronzer, to create a sun-kissed look on my skin. But then, finally I thought, I should give this Mineral Enhancer a try and tried out this in Warm Kiss shade. The Sheer Perfection finishing powder came in 2 varieties - matte and silk and I obviously took up silk! They also do have a range of brushes. I don't have a kabuki brush and for mineral makeup, kabuki is essential and I loved this brush. It was soft against the skin, yet it was very firm. Well I haven't tried Mineral makeup so far and the moment I used this, I loved it!!! With so many shades available, its easy to find the one that suits your skin tone. The Medium Golden was perfect for my yellow undertone wheatish skin!!! I applied my Olay Cream and Serum as the base. On top it I applied the Medium Golden Foundation. I loved the way the foundation felt on the skin. It felt like it wasn't on top of skin, it felt like a part of the skin. It felt very light. It didn't clog the pores and preserved the natural texture of my skin. It did not look or feel cakey at all. The lippies is Lakme Enrich Satin in 129 and that eyeshadow is from Coastal Scents Mirage Palette. Guess what? The Coastal Scents eyeshadow usually creases after a few hours without a proper base. Today I wore it atop Olay and Mineral Hygenics foundation base and even after 5 hours, the eyeshadow did not budge a bit! You can buy yours from their website www.mineralhygienics.com. And since you're my awesome readers, you can avail a fabulous 10% off with this coupon code: fashionpanche. 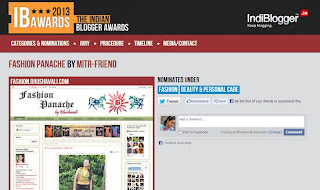 Btw, on the other hand, this blog, Fashion Panache has been nominated for the Indiblogger awards. So don't forget to share your thoughts and testimonials there, about my blog. The product was gifted by the company for reviewing purpose, however the opinions are of my own experience and are this post does not to advertise the product. Lovely FOTD, you are looking so pretty. Mineral makeup is so fantastic! You look really wonderful, I love how you have that glow to your skin. I use Jane Iredale mineral makeup in winter it is pretty good. Amazing make up!!! Great post!!! I`m happy to follow your blog!!! i like this shades. I always go for all natural/barely there make up. The shades really suits you well. I followed you on bloglovin and GFC. hope you do the same. thanks. Beautiful shades, just perfect for you skin! Thanks for the comment on my blog. I love these products, great look! Great products and lovely colors!!!! I'm already following you hun and I liked your FB page!!! That has such a flawless finish! I loveit! I love the eyeshadow colour, love how it gives a natural look. I love using powders so great post! I must admit I've never tried mineral foundation! It´s a pleasure for me that now I followed you on gfc! How gorgeous! I love this natural look. It's so pretty! Beautiful! It's great that the eyeshadow stayed on for hours with the base! Just followed you back! Please check out newest post at www.loveolia.com! I'm following you now on GFC, BL & FB! Your eye makeup looks great! The make up looks good on you! Looks like really great products! I would like to try them too! Great post. the eyemake up looks great on you.